Buda Cemeng Klawu is a day devoted to Bhatari Rambut Sedana or Goddess Lakshmi. Special offerings are made and arranged together with the place or box, which is used to save money. This is an expression of gratitude for the abundance and fortune of Goddess Lakshmi. Goddess Lakshmi, 2017. Acrylic on Paper, 18 x 24 cm. Goddess Lakshmi symbolizes the importance of economic activity in life. 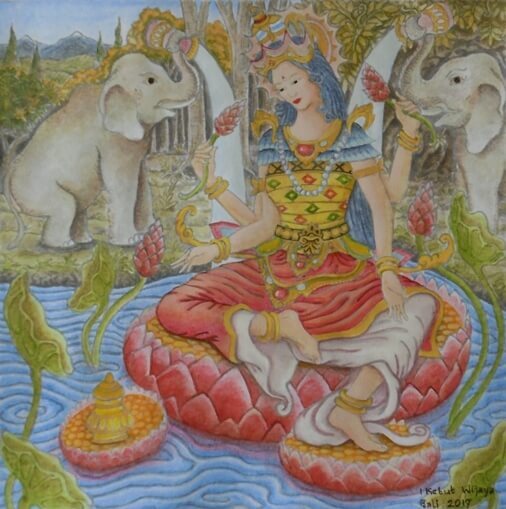 The goddess is depicted as a beautiful woman who is meditating on a lotus petal and holding the lotus bud in her hand, as a symbol of fortune, self-knowledge and spirituality. Her four hands represent the purpose of human life in Hindu beliefs, including: Dharma, Artha, Kama, and Moksha. This holy day is held every 210 days each year, 6 (six) months according to Bali Calendar. This ceremony falls on Wednesday or Buda Wage wuku Klawu, so often referred to as Buda Wage Klawu. The ceremony is celebrated by Hindus and especially for those who own businesses, stores, stalls, restaurants, financial services and others. Balinese believes that during this day, Bhatari Rambut Sedana is meditating, as well as a taboo for people in using money for things that are not return back in the form of goods, such as paying debt or saving. According to local belief, the money will not return back and disappear forever.